Spinach is an annually-grown edible plant. Spinach, which belongs to the Amaranthecea family and with botanical name Spinacia oleracea is a good source of vitamins and minerals, no wonder vegetables are always recommended as part of our daily foods due to its importance. 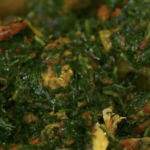 Spinach is widely known all over the world which is not surprising as it provides great nutritional values such as carotenoids which the body utilizes to form vitamin A, it provides vitamin C – a strong antioxidant for healthy skin and immune system and a good source of vitamin K for blood clotting. Spinach has many potentials; see nutritional values of spinach according to USDA. 1 habanero peppers (you can use grinned or crushed chili pepper). You can also use bell pepper in place of habanero or chili pepper if you don’t eat chili pepper at all. Wash, spice, add a glass cup of water to your meat, and set on the stove to cook for 20 minutes. Transfer your washed and cleaned tomatoes, bell pepper, habanero and one of the two onion bulbs into a blender and crush (I said crush because you don’t want to blend this mixture into a paste). Chop the second onion and set aside. Now set the pot you wish to cook your soup with on the stove with medium heat applied. Pour the oil palm into the pot and add ¼ of the chopped onion, allow to sauté for about 3 minutes, (I do not recommend bleaching the oil as this will kill the valuable nutrients in it). Add the crushed mixture in the blender, spices, a pinch of salt and grinded shrimp; then cook for about 15 minutes and stir after every 5 minutes to prevent your sauce from burning or sticking to the pot. After minutes, you will notice that the sauce now have the texture of a beautifully fried tomato stew (sauce), the water content of the tomatoes must have reduced and the oil will be at the top. Add your boiled meat, fish of choice, shrimp, the meat stock and stir, then allow to cook for about 10 minutes. NOTE: the meat stock should be little (8 ounces cup-size of meat stock). If you don’t have meat stock, add little quantity of water. Now add you chopped and cleaned spinach, mix and allow to simmer on a very low heat for about 10 minutes. Congratulation! You now have your vegetable soup. You can eat this soup alone, you can also use it as soup for semolina, cassava flakes, wheat, poundo-yam and corn flour balls, I like using it as topping on rice.